PTCL has introduced a new call package for new and existing Vfone customers residing in Sindh. This newly announced package is named as "Vone Sindh Package". This call package enables PTCL Vfone customers to call as low as 50 Paisas per minute. 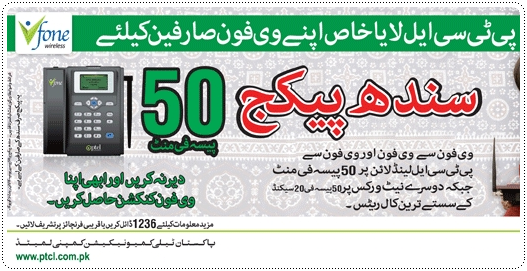 Sindh package has a daily rental fee of 50 Paisas per day. With this package customers can enjoy Vfone Internet @ Rs. 2 per 15 minute. Send SMS to any Pakistani network @ 30 paisas. PTCL has launched this package in the start of October 2012 and new Vfone customers will get their Vfone with this package. Package Provisioning: CSRs at NADRA registration portal (at the time of 789 dialing) will upsell this package to new Vfone customers. PTCL Vfone has the country’s largest WLL coverage and is available with the liberty of prepaid & Postpaid options. Vfone Simple package offers dialing at affordable rates with zero line rent. PTCL Vfone supports internet with CDMA 1x technology. SMS facility to and from all networks at very nominal rate of Rs. 0.30 per SMS.